There are three main types of tactical vests. The Cross Draw, the Chest Rig and you have the Plate Carrier that rounds out the group. Our article today focuses more on chest rigs and cross draws and we plan to do a full review article solely dedicated to plate carriers at a later time. Finding the right tactical vest is can be a complex decision that’s influenced by looks, feel and fit. A good vest is durable, comfortable, and easy to access. Just like a good gun safe, a tactical vest should have as much, or as little room as you need. Different people have different preferences and an expansive market has sprung up to provide tactical gear for nearly any mission, and any user. Finding a vest can be difficult, but we’ve narrowed it down to the top ten we’ve found to be comfortable, durable, and mission ready. Below you will see a comparison guide of our top 10 picks, along with a review of each in further detail below it. Now that we’ve given you a guide to utilize, let’s take a look at each of these options in a little more detail. 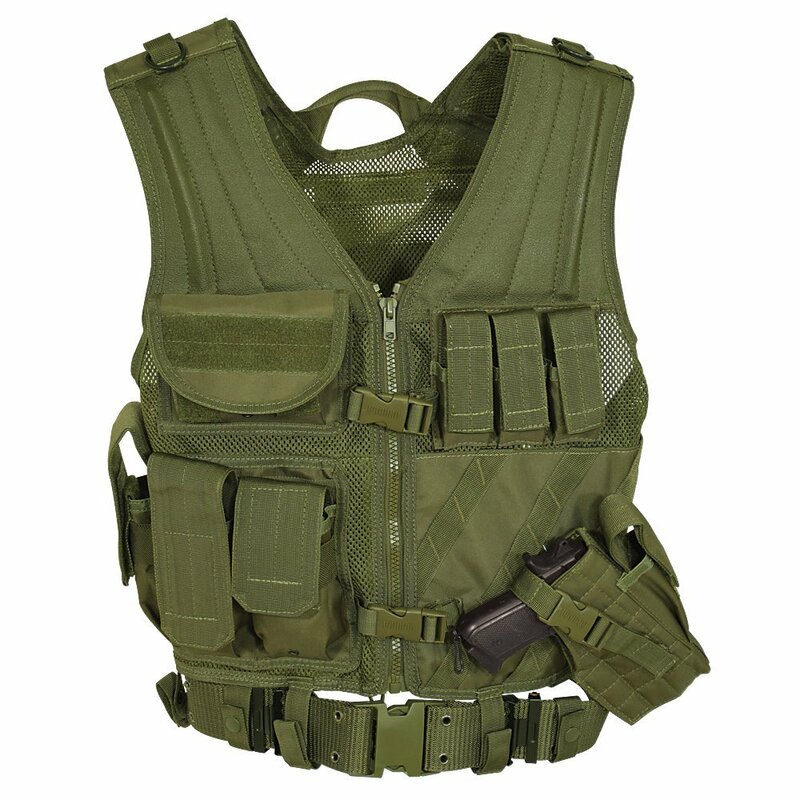 The UTG Sportsman is a heavy duty, well made tactical vest. The UTG Sportsman is probably the most adjustable tactical vest out there and is one size fits all. This vest is easy to adjust for both men and women and allows the vest to be nice and snug on the body. The UTG Sportsman has 4 magazine pouches on the vest, three on the left-hand side, and one on the right. The right side magazine pouch was for a large radio. There is, in fact, a smaller radio pouch on the right shoulder and works well for a basic walkie-talkie. That smaller radio pouch is for a compass. The vest features a cross draw holster for full-size pistols and three pistol magazine pouches above the holster. The Condor cross draw tactical vest is a comfortable vest made from a durable nylon material, with an internal mesh material. The mesh material aid in comfort and airflow, as well as wicking moisture away from the body. The Condor Crossdraw is equipped with the basic necessities, including a pistol holster, and enough magazine pouches for most shooters. There are three chest mounted pouches and 1 quick access holster mounted pouch. The Condor is a comfortable vest, with easy access to both pistol and rifle magazines. The vest can hold three rifle magazines, and these pouches are situated on the left-hand side for quick access. The right shoulder features a padded element to help reduce the feelings of recoil in the shoulder. The CrossDraw can be adjusted significantly to fit people of all sizes, and is easy to adjust. 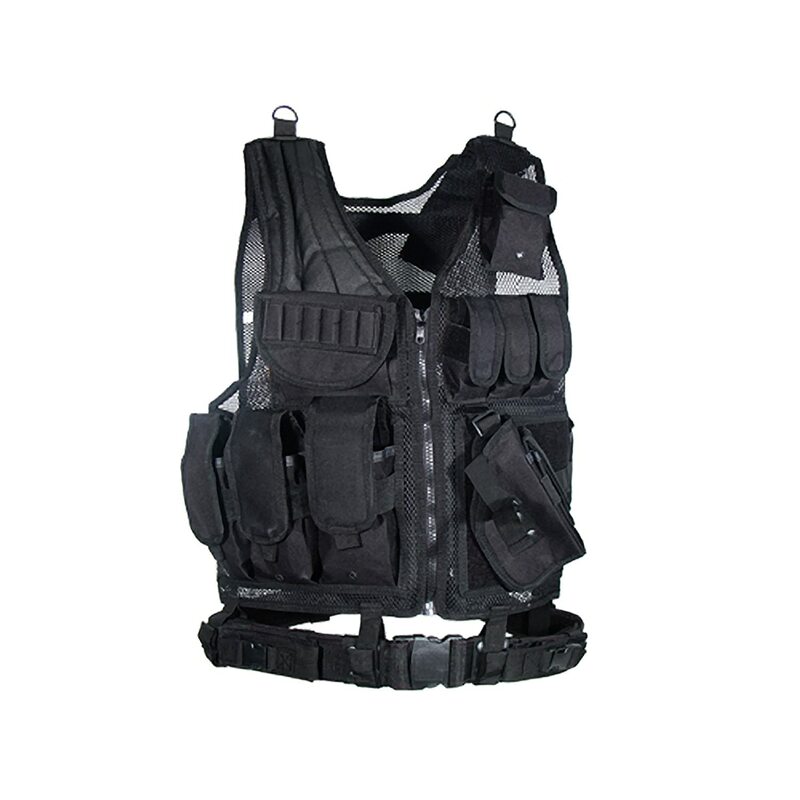 The Crossdraw is a comfortable and lightweight option for those looking for an assault vest. The Modern Warrior Tactical vest is a complete tactical vest system. 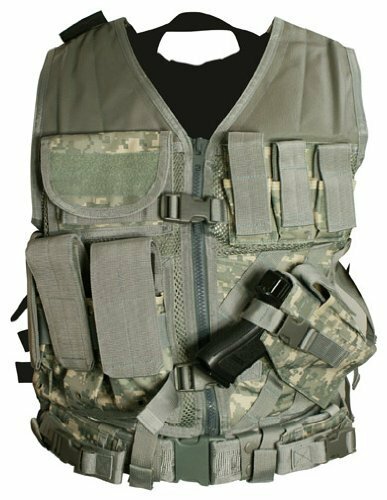 The Modern Warrior tactical vest comes with numerous pouches for ammunition, admin gear, and additional tactical accessories. The vest is complete with a heavy duty nylon pistol holster in a cross draw position, and unlike other vests this holster is removable. Above the holster is three magazine pouches that fit three full sized pistol magazines. The included holster can fit most firearms, but larger firearms like the Glock 21 tend to be a bit big for the holster. The Modern Warrior tactical vest has three rifle pouches, capable of holding six rifle magazines, and are easy to access. The included accessory pouch is complete with five elastic loops for 12 gauge shotgun rounds. The vest is adjustable for a multitude of sizes, from medium to extra large. Smaller users may find the vest baggy and difficult to wear. Even for larger people, the vest is said to be snug, but not uncomfortable. 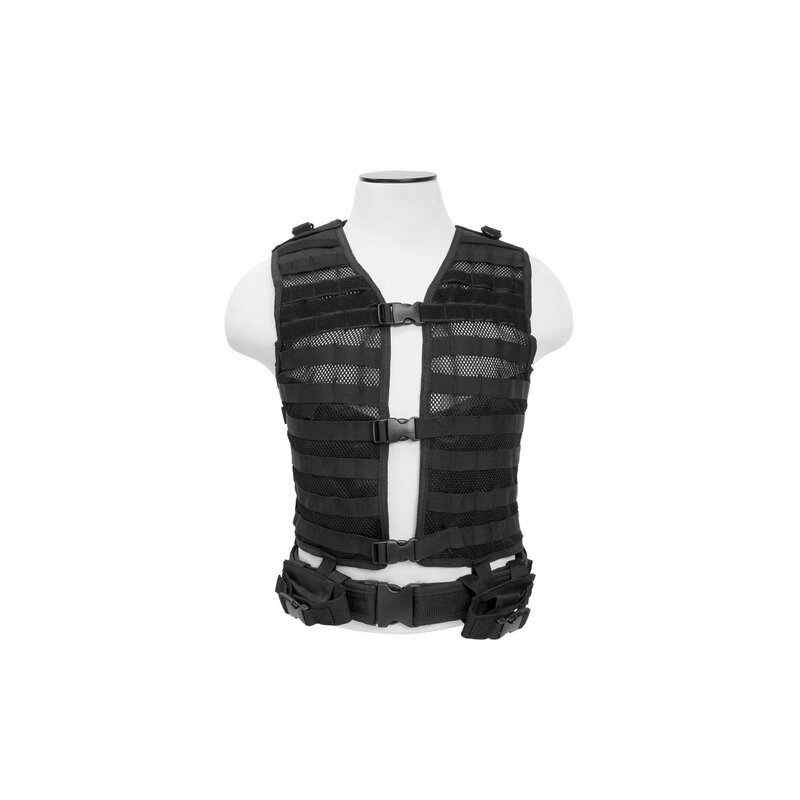 The vest is equipped with a reinforced right shoulder to help reduce recoil of long guns. 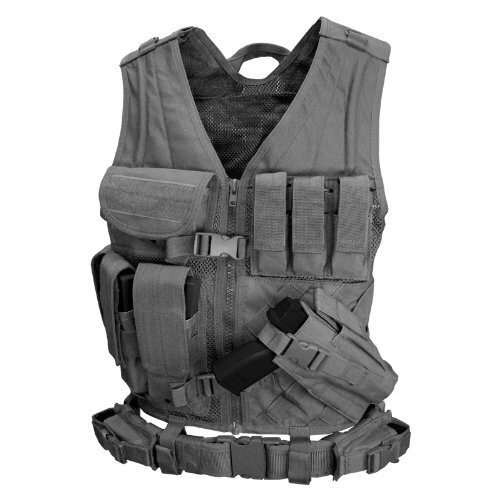 The Modern warrior tactical vest is a affordable, and capable option for most people. This is a variation of the NcStar VISM and is a top selection of many people in need of a vest that they can customize. This is one differs from the other VISM models significantly. First let’s look at the pouches, well, there is none to look at. This model is bare and feature an extensive network of MOLLE/PALS webbing. This allows complete customization of the vest by the user. While the majority of users will run a carbine and a pistol, some may find themselves in specialized roles. This includes shotgunners, marksmen, and snipers. They have specialized pouches and components they may need for their specific tasks. The NcStar Vism is tough and durable, as well as being comfortable and the webbing system held a variety of pouches, holsters, and hydration bladders without issue. The NcStar vest is a good vest, especially when the budget is taken into consideration. The Blackhawk Omega Phalanx tactical vest is made from a heavy-duty nylon mesh that allows the material to be both strong and dependable, and lightweight and breathable. The vest is equipped with Blackhawk’s proprietary HawkTex sniper shoulder for maximum control and comfort of a bolt action precision rifle. The vest is outfitted with a total of 4 magazine pouches, two double rifle pouches, and two single pistol pouches, as well as a 14 round shotshell pouch. The vest is complete with a hydration bladder carrier, large mag pouches and is compatible with Blackhawk Strike pouches. The vest is comfortable, and the magazine pouches are especially easy to access for rapid reloads. 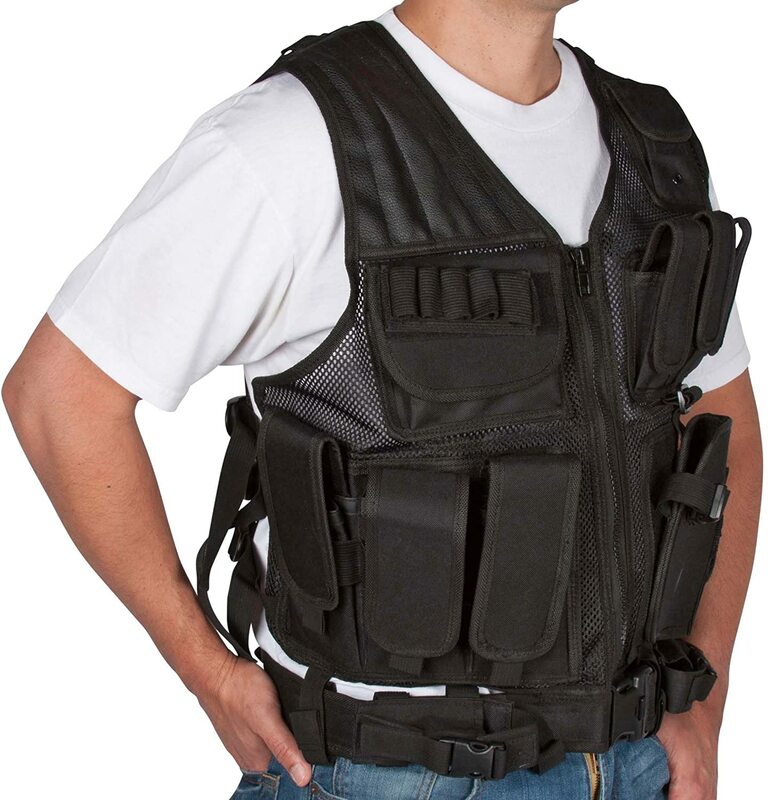 The vest is also large enough to be worn over body armor, and comfortable for all day use. The Blackhawk Omega vest is an option for those looking for a rapid method of attaching gear to their body and over their armor. The Northstar tactical assault vest is a universal vest designed for use with handguns and modern carbine rifles. The Northstar comes complete with a heavy-duty nylon holster that is designed to fit any popular full sized handgun, from the popular Glock 17 to the classic 1911. The pistol magazine pouches are designed to hold double stack magazines up to 45 ACP. There are three rifle magazine pouches designed for the AR platform but can fit AK and H&K 91 magazines. The inside is coated with a lightweight mesh for maximum comfort and breathability. The external material is Tuff cloth and is durable and can hold up to repeated rough use. 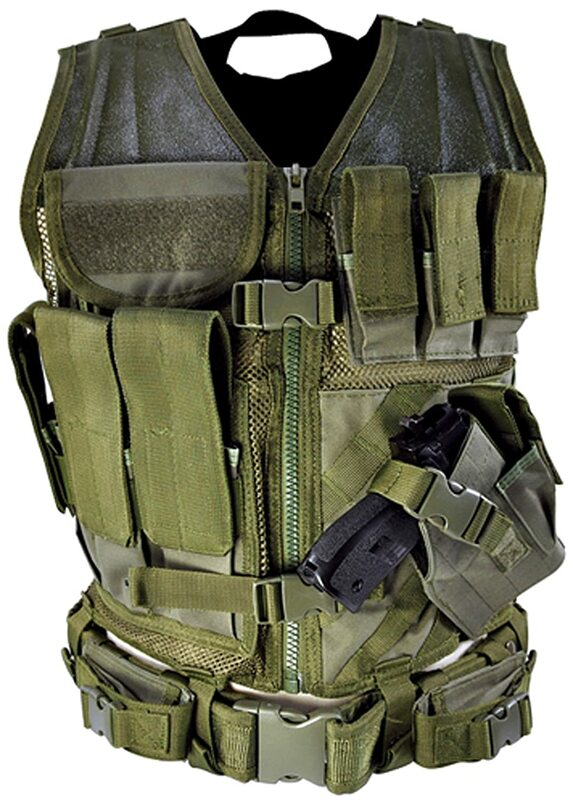 The vest comes with a complete pistol belt that is adjustable and connected to the base of the vest. The Northstar is another option for those running a pistol and a well equipped tactical AR-15 rifle with a scope. The NcStar Vism vest offers an option for those on a budget. The Vism vest is a complete tactical vest, with a torso mounted pistol holster and pouches for a rifle and a pistol. The Vism features a nylon holster designed for modern semi-automatic handguns and is complete with six handgun magazine pouches, Three of these pouches ride on the chest portion of the vest, and a fourth is attached to the weapon’s holster. Two other pouches ride on the vest’s included pistol belt. The vest is complete with three single rifle magazine pouches and can fit both AR and AK magazines. The vest is constructed from PVC material which is known for it’s inherent strength and flexibility. The internal material is a comfortable mesh that provides ventilation to aid in keeping the wearer cool. The vest is adjustable and can be adjusted for most body types. It’s important these vests are properly adjusted for each person, this ensures easy access to the pouches and maximum comfort. The NcStar Tac vest is a modern option for those looking to prioritize their access to certain gear. The NcSat Tac vest comes equipped with pouches for both rifle and pistol, as well as a mounted holster. The vest comes with a pistol belt, but the holster is mounted on the torso portion. The vest is secured by two torso clips and a secondary zipper. The vest has 3 adjustment straps to make fitting easy for all body types and heights. The pistol holster is a cross draw design and this is important to know for those who are not fans of cross draw. The vest is complete with 4 pistol pouches for double stack magazines and three rifle magazine pouches. The vest includes a utility pouch for a small knife, multi-tool, or flashlight. The back of the vested is covered with PALS to attach accessories like a hydration bladder pouch. The Condor Elite Tactical vest is designed for the rifleman. The tactical vest is complete with six adjustable rifle mag pouches. These pouches are double magazine pouches and the vest can hold a total of twelve magazines. The vest does not have pistol magazine pouches or an attached holster, although the vest has an attached pistol belt. This vest is for the average American infantryman who is not issued a pistol and relies solely on a rifle for fighting. The vest does feature two small utility pouches that could be home to a GPS unit, a compass flashlights, and extra batteries. The Condor elite also has two small internal pockets for folded maps, or note taking gear. The vest is wide in the shoulders which helps when carrying 12 loaded AR mags, which are about a pound apiece. The Condor Elite is a well put together vest that covers all your bases in any survival situation. 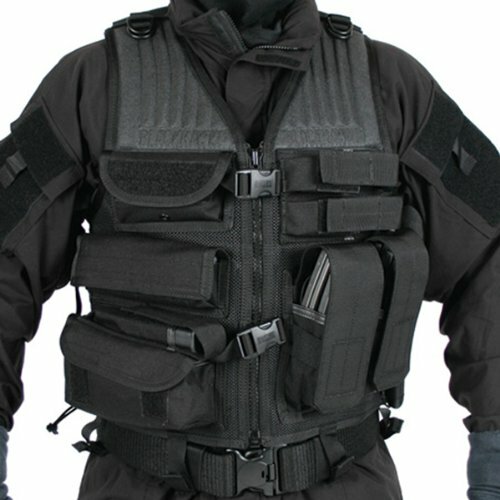 Designed with advice and the knowledge of experienced law enforcement advisor Voodoo tactical has built a dynamic, lightweight vest designed for the typical SWAT operation. 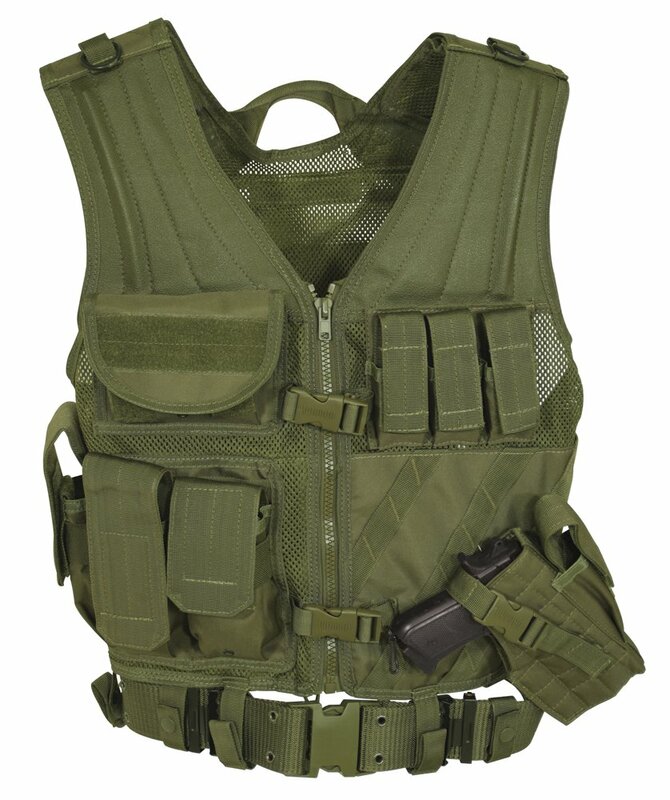 This vest is not designed for long, drawn-out encounters, but rapidly moving raids and entry. 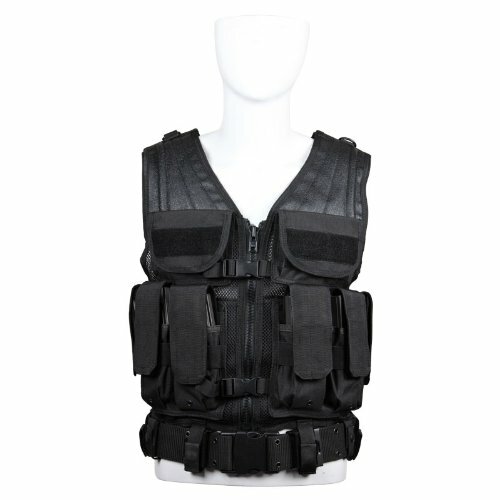 The vest is designed to permit wearing an armor vest underneath, and is designed to be lightweight and well ventilated. The vest is designed with stabilizing ribs in the shoulders, which help increase the grip of a rifle, and especially a wire stock sub-machine gun. The pouches include 3 rifle, 3 handgun, and 5 elastic loops for shotgun shells. The elastic pouches give a designated breacher a method of carrying breaching and buckshot rounds. The vest also features a full-size universal pistol holster and a pistol belt. The Voodoo entry vest is probably the lightest vest in our list and by far the coolest in terms of temperature, but also more expensive. A good tactical vest can be a valuable piece of gear, and is essential for any recreational or serious tactical shooter. We really look at owning a tactical vest as a must have, especially for urban survival situations. If you are having to trek out into the wilderness, the flexibility owning a great vest will give you is worth it when looking for something to help carry the extra magazines of ammunition and any other gear you deem necessary. A bad vest can actually be worse than having nothing. A good vest is supportive and suits your mission and your goals. Never buy a vest and compromise yourself and your gear to it. You should never try to turn a well equipped standard rifle like a Mosin Nagant into a shotgun bandolier, so use what’s mission ready.